Serie de TV (1995-Actualidad). Más de 1000 episodios. Momoko Sakura es una estudiante de primaria que vive en la provincia rural de Shizuoka. 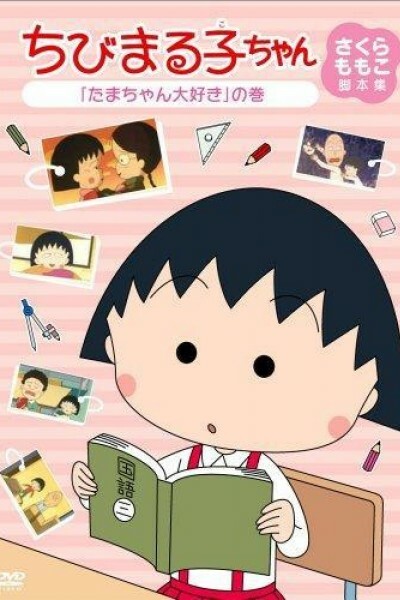 Habitualmente es llamada «Chibi Maruko-chan», por su corta edad y estatura. Vive en casa con sus padres, abuelos y hermana mayor; y en la escuela tiene muchos amigos. Su historia cuenta situaciones cotidianas, que retratan las cosas sencillas de la vida. Today is Sensei's Home Visit! / Let's Meet the Pretentious Kid! Maru-chan Learns to Ride a Bike! Maru-chan Gets a Certificate! / Maru-chan Catches a Cold! Maru-chan and Friends Find a Puppy! My Family Eats French Cuisine! / Maru-chan Hates Marathons! The Valentine's Day of Sadness! / Hanawa Enters a Singing Contest! Maru-chan Practices the Recorder! / I Want to Eat Snow! A Citizen's Devotion to Disaster Drills! / Maru-chan Gets Her Report Card! The Legendary Tsuchinoko Company Limited! / Maru-chan Likes Preparing for Field Trips! Maru-chan Goes on a Field Trip! The Yearned-For Nosebleed! / Home Alone With Sakiko! Finally! Maruo and the Class Election! Maru-chan Gets Appendicitis! / Maru-chan Gets Her Fortune Told! Maru-chan Really Wants a Bird! / Maru-chan Has a Birthday Party! Mom's Treasure! / Maru-chan's Late Night Feast! The Boy from the Orient in May! / The Parental Visit of Melancholy! Maru-chan and the School Arts Festival! Maru-chan Gets Pen Pals! / I Love Free Study Time! Maru-chan's Tooth Hurts! / Ah! The Physical Examination! Maru-chan Gets a New Umbrella! / Maru-chan's Summer Memories! Maru-chan's Bathtub Is Broken! / The Old Man's Magic Cards! Maru-chan Goes to School During Summer Break! Maru-chan Goes to the Haunted House! Maru-chan Didn't Finish Her Homework! Maru-chan Goes to a Photographer! / The Night of the Big Storm! Maru-chan Changes Seats! / Maru-chan Goes to an Oden Stall! Maru-chan Wishes Upon a Star! I Can Hear a Whistle! Maruko, 100 Years in the Future! / Hanawa's Gone! ?